The Marmot Turret 3P is everything you’d want in a three-man tent. It’s lightweight, compact, and wind resistant. It keeps you dry even in the whipping rain, and it’s remarkably easy to set up. 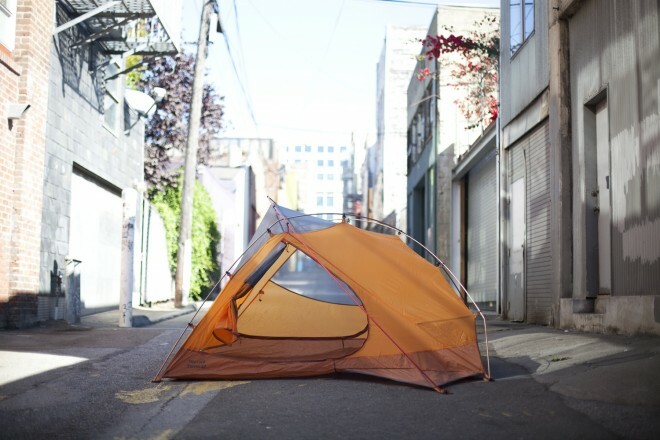 However, with a price tag of $430, you’d half expect the tent to come with maid service. Do not bring this tent to the local Occupy encampment. You’ll likely be chased out, or become the target of a new Occupy movement. All the campers around you will know you’re part of the upper crust when you unveil this plush, ostentatious dwelling. This oddly shaped tent, in an anthropomorphic sense, is gorgeous. All the campers around you will know you’re part of the upper crust when you unveil this plush, ostentatious dwelling. Sure, there are plenty of luxe, lightweight, three-man tents made for backpacking that cost more than $400. But with packed dimensions of 8.5 x 28 inches, the Marmot Turret 3P isn’t ideal for stashing in a pack. It’s better suited for car camping, and if that’s your speed, you could spend half as much money for something agreeable. But with the Marmot, you certainly do get a lot for your money. The asymmetrical poles are a brilliant design twist, and the rain fly is strong enough to repel the harsher elements and (in my testing) even bears. During a recent week-long fishing trip near Yosemite National Park, the Turret 3P withstood a flash rainstorm, then later, a vicious bout of wind and hail. Everything stored inside, me included, stayed bone dry. A bear even rubbed along it one night, leaving behind a set of tracks to prove I wasn’t hallucinating. Setup is so simple that sobriety is not required, and one person can do it in a snap. The three asymmetrical foldable poles, which are made of DAC’s Featherlite material, are 15 percent lighter than aluminum, and they latch easily to the clips lining the outside of the tent’s dome-like body. The feet of the poles snap into a locking system, allowing the tent to maintain its form and rigidity without stakes. Obviously, you’ll want to stake it down if it’s windy. It’s a 10-minute job, tops, giving you more time hunting for that trophy fish. It might take a few more minutes to attach the rain fly. It’s adjustable and fits snugly. The fly has a door on each side, covering the tent’s two doors. That is a huge plus for tents with low vertical clearance, and means camping partners can pick the nearest exit. 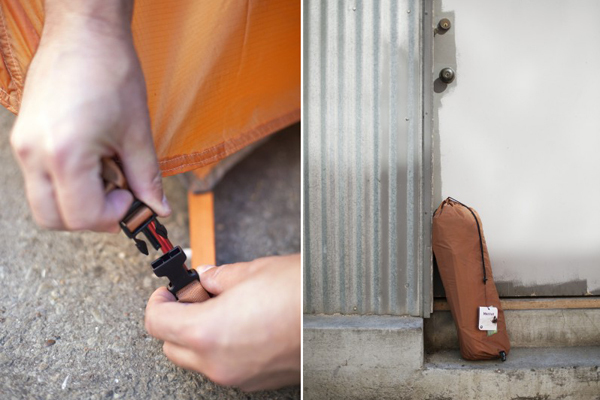 For extra support, fasten the fly to the tent’s poles using the velcro ties on the underside. Also, if you’re looking for some bare-bones shelter, you can use the rain fly without the tent. The Marmot Turret 3P has all the interior trim you’d expect from a top-shelf tent, including gadget and key holders inside in each of the four corners, strong mesh windows, a fully taped and catenary-cut floor, and a lantern loop on the ceiling. It’s strangely shaped, at 51 inches by 72 inches by 90 inches, meaning three campers is a tight squeeze. Two campers fit in my testing. Granted, we used a queen-sized blowup mattress that virtually consumed the tent’s 41-square-foot floor area. But even with sleeping bags and simple mats, three is definitely a crowd. The whole package weighs about 6.5 pounds and packs in an 8.5 by 28 inch nylon bag. As I said earlier, that makes it a great choice for loading in the car, but too big to pack on your back. So there’s the trade-off — you can pack a palace in your chariot, but for a price that may force you to skip the champagne. WIRED Setup is so easy it should be illegal. Withstands the elements with aplomb. Packs nicely into the trunk. TIRED High list price is a crime. It’s really a two-man tent. Bulky when collapsed; not well-suited for backpacking expeditions. Too pimp for the Occupy protest.